CO Recreational Marijuana Legalization: The First Two Years Part 2 - Tiftickjian Law Firm, P.C. Are Colorado Marijuana Citations High Enough? Legalizing recreational and retail sales of marijuana kept Colorado law enforcement and highway safety agencies busy in 2014. The AAMVA (American Association of Motor Vehicle Administrators) declared 2014 the year of “Impaired Driving.” The highway safety advocate group Mothers Against Drunk Driving was busy adding drugged driving to their mission statement. Denver police were busy handing out pot-related citations, and Colorado State Troopers were scheduled for high visibility efforts and attending drugged-impaired recognition training sessions to become Drug Recognition Experts. Data-collecting departments began implementing new policies and procedures to more accurately track marijuana-related data, the DOT advised County Coroners to use a new electronic procedure to report data, and the Colorado State Patrol took the lead as the only law enforcement agency in Colorado to track drug impairment by drug type. 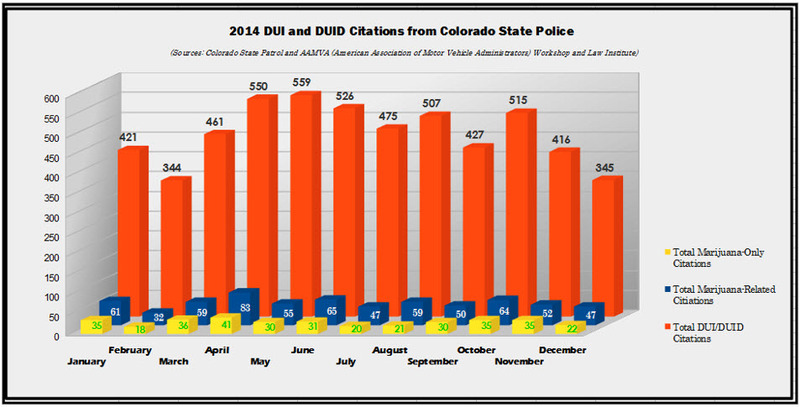 The vast majority of 2014 DUI and DUID citations from the Colorado State Patrol did not involve marijuana. January 1, 2014 was the first day of legal retail marijuana sales. Trooper visibility and Drug Recognition training was increased, and there was a million dollars spent on a “Don’t Drive High” campaign. Interestingly, the Colorado State Patrol did not use the word marijuana (or cannabis, or pot) once in their 2014 annual report, but it was the first year citations for drug impairment were broken down to provide more accurate data on marijuana drugged driving offenses. Comparatively speaking, marijuana-only driving citations were a pittance of total DUI and DUID citations. Overall, including illegal drugs with marijuana, and alcohol and marijuana combined citations, 12% of DUI/DUID citations involved marijuana. If statistics were logical, that would mean that 88% of DUI and DUID citations handed out by the Colorado State Police did not involve marijuana, despite the celebratory nature of newly available retail marijuana sales. The 2014 records the Colorado State Patrol collected will be setting the benchmarks for future years, and for other states that follow the trend of marijuana legalization. The fatal accident statistics in this graph include all fatal crashes, for any reason—drug, alcohol, weather, or a freak accident. The total marijuana-related include marijuana and alcohol, marijuana and other drugs, and just marijuana citations. Marijuana-only citations were added as a separate line, even though they are included in the “total marijuana-related” citations, so that we can compare fluctuations. A further breakdown is given later in this article. In 2014 there were 4,177 proactive citations handed out (the Troopers are out looking for drunk and drugged drivers), and 1,369 reactive citations (the Trooper responded to an event, or was at a scene, and came across a DUID or DUI event). How Do Proactive Citations Help Accidents? Do proactive citations help? Ideally, handing out proactive citations should reduce reactive citations and the number of fatal crashes. 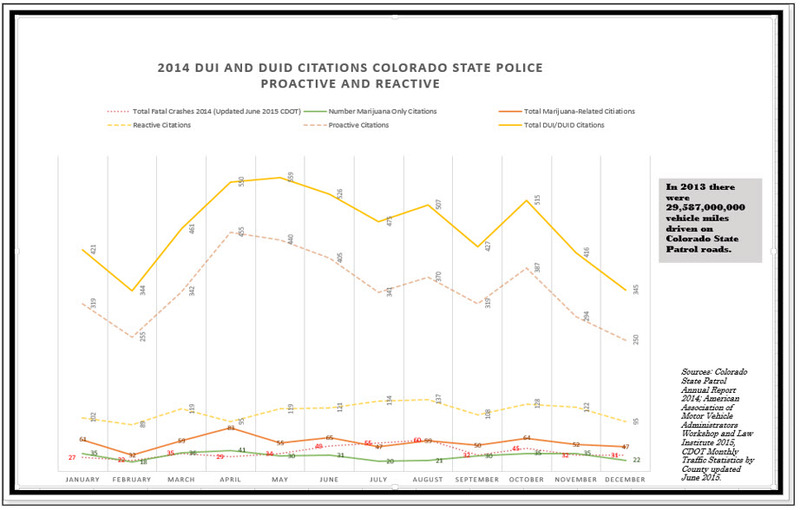 From March to April, when Cabin Fever turns to Spring Fever in Colorado, we can see that proactive tickets went up, citations for DUID increased, and reactive citations and fatal crashes decreased. But, this idealism is short-lived. Proactive tickets went up again from July to August (vacation time! ), but fatal crashes increased, DUID citations and reaction citations increased, and marijuana-only tickets stayed about the same. From September to October (Labor Day weekend) proactive citations increased, and so did fatal crashes and DUI/DUID citations. Looking at December, we see that proactive and reactive citations decreased (holiday spirit? ), DUID and marijuana-only citations decreased, and fatal crashes stayed about the same (which could very well be weather-related). In the beginning of the year, February shows a sharp decrease, but Mother Nature probably had more to do with that than the patrol officers. The CSP reactive citation curve and fatal accident curve have similar wavelengths (which is logical), but the marijuana-only citations do not follow the same pattern. The marijuana-related tickets are all over the place, but these involve alcohol, heavy drugs and prescription drugs as well. Looking at sub-groups of marijuana-related and drug related DUID tickets, we can see that different patterns take place, despite each group having the same Trooper Visibility and proactive citation efforts from Colorado State Troopers. Each group also had the same seasons, weather and holidays. Educators, Media and Law Enforcement may want to make a more proactive effort in the summer months to combat the higher use of alcohol in combination with marijuana. Let’s take a different perspective into the drugged-driving citation scenario, and pretend that citations can be looked at as personality types: The Influenced Drivers, The Illegal Drug Users, People that enjoy being high in the Rocky Mountain state, and College Kids. Looking at traffic tickets handed out is certainly not an accurate measure of the impact of marijuana legalization in Colorado, handing out more or less tickets does not mean there are more or less drug-impaired drivers on the road, it just means more tickets are being handed out. But, it’s a start. Patterns provide insight to behavior. After all, it is a person that received the DUI or DUID citation, and that person’s behavior led to the drunk or drugged driving offense. Common sense tells us more people will consume marijuana now that it is legal. Proactive efforts by the Colorado State Police are meant to protect the people and property in Colorado, and are worthwhile. However, not much changed on the highways in 2014 except increased police presence. Now that we have more insightful data, 2015 and 2016 should prove to be a year of marked improvement. >Legalizing Recreational Marijuana: As Dangerous as a New iPhone? >Are Pot Smokers Ruling the Roads?